We always love to improve our products. The new Booster Youth contains Amla powder, one of the most important herbs in Ayurveda with strong antioxidant properties. The price remains the same! The Happy You Booster Youth is your daily ritual to give your body essential building blocks. Our natural vegan sourced amino acids are combined with „the“ ayurvedic power plant ashwagandha. Our Booster helps you to build youth all over. And of course it is made in Germany. Sustain your full potential of beauty, flexibility, fitness and power! 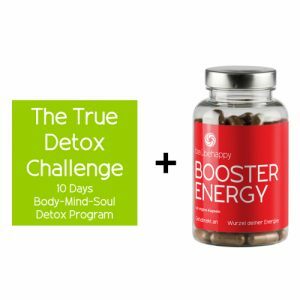 One bottle with 120 capsules for 30 days of supply. Shipment only to Germany and Austria. Do you really have to face the fact that youth just depends on age? You can experience the inner glow and power at any age by awakening your internal spirit and sustaining your body into a state of recovery and freshness. In the ayurvedic philosophy youth is mainly connected to flexibility. Flexibility in a sense of staying moved on all levels. Mentally open, great leaning spirit, smooth body movements in a wide range and a open heart to fill our spirit. This requires a strong caring from our side. 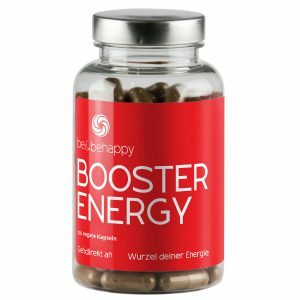 The HAPPY YOU BOOSTER YOUTH will give your metabolism the needed building blocks to keep all physical functions on a high level. This is why we believe in adding natural amino acids. But this not the end of a BE HAPPY BOOSTER. We added wonderful ayurvedic herbs to make your Booster more effective and precious for you. Ashwagandha will give you the bonus kick to boost your inner construction power. Ashwagandha (means the strength of the horse) is traditionally used to improve overall strength, immunity and rejuvenating effects as the so called „indian gingseng“. Amla is one of the most important herbs in Ayurveda and has strong antioxidant properties. One bottle lasts for 30 days with the recommended daily intake of 4 capsules. 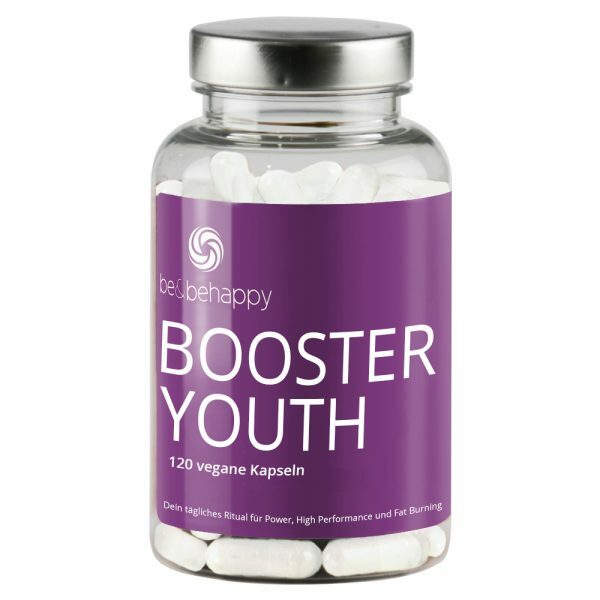 We recommend to continue with the Booster Youth after the first month as a regular food supplement for maintaining the results. Food supplement with natural amino acids and ayurvedic herbs. Adults are recommended to take 2 capsules after a meal twice a day with sufficient water. Best in the morning and in the evening. The recommended daily intake must not be exceeded. Food supplements should not be taken as an substitute for an adequate and balanced nutrition and a healthy lifestyle. Keep the product closed and out of reach of small children. Protect from light and store in a dry place and not above 25°C. Close well after withdrawal. Withania Somnifera Root Extract (Withanolide), Coating Hypromellose, L Leucin, L Lysin Hydrochlorid, L Isoleucin, L Phenylalanin, Amla Fruit Powder, L Threonin, L Methionine, L Thryptophan.